A pull up tower is a compact, versatile workout tool that allows you to perform pull ups, chin ups, dips, push ups, and vertical knee raises right in your own home. 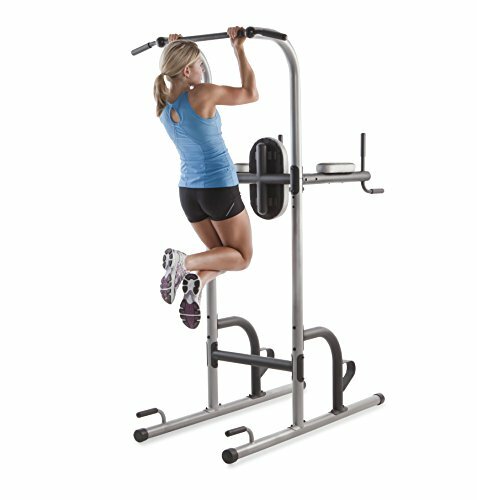 With this machine there is no need to put holes in the wall or ceiling in order to create a pull up station. This makes it ideal for people who are renting their home. In this article, we’ll provide you with a complete breakdown of the 6 best pull up towers on the current market. We’ll also equip you with the key knowledge you need when shopping for a pull up tower. Then we’ll cover some FAQs to answer those nagging questions that you may have about pull up tower workouts. The Fitness Reality X-Class Pull Up Tower is a true beast of a unit. As such, it is a little bulkier than many of its competitors, but the extra size is well worth it. The X-Class provides you with a maximum weight of 400 pounds, which is the heaviest that we have yet to come across. That speaks volumes as to the rigidity of this unit. That makes it ideal for you heavy lifters who are used to strapping 45 pound plates to your body when doing dips and pull ups. You will have absolutely no worries about this pull up tower wobbling around half way through your workout. To make the X-Class even more rigid, it comes with a unique stabilizer system, which is quite different from other power towers. It also has pre-drilled holes so that you can secure the tower to the floor if desired (though you certainly don’t have to). The X-Class allows you to customize the dip bar to 7 different settings. This means that it is ideal for people of all heights. There are also two options as to pull up bar positioning. The maximum height of the pull up bar is 83 inches, which makes it suitable for taller users. 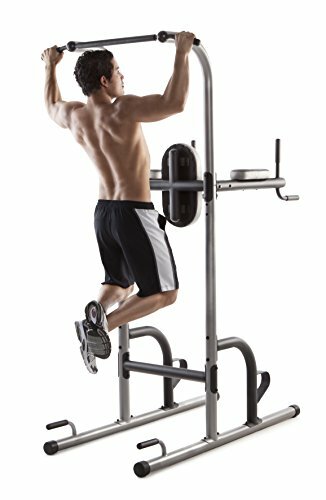 The unique adjustable dip bar system allows you to do a lot more than just the traditional 4 exercises on this unit. In fact, you can perform as many as 30 different pull up tower exercises, including one-legged squats, reverse dips, and inverted rows. As mentioned already, the X-Class is a bulkier unit than most. The footprint of the machine is 63.4 inches long by 49 inches wid and 83 inches tall. It is quite a bit more expensive than most of its competitors. However, for your money, you are getting a commercial gym quality power tower. 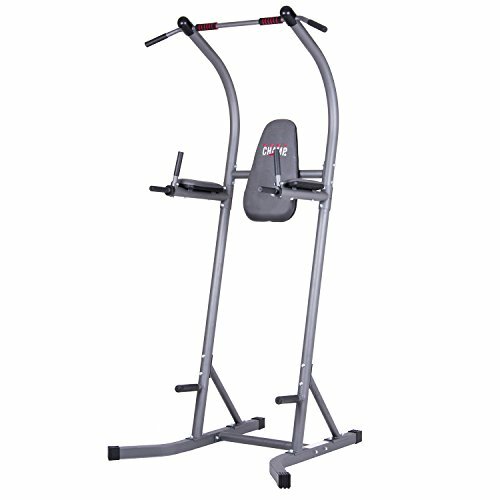 The Bowflex Body Tower provides you with the quality of product that you would expect from the Bowflex company. This is a top end tower with great features. The Bowflex Body Tower provides you with 7 levels of easy adjust horizontal bars that allow you to do more than 20 exercises. They also allow you to increase the intensity of various exercises. 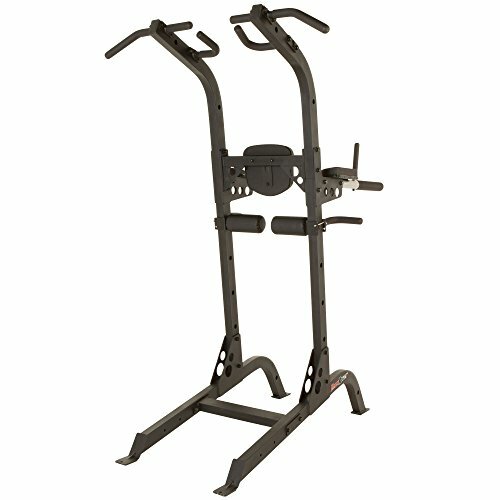 The stable, commercial grade steel frame of the Bowflex Body Tower will keep you secure while working out. It also features a well-designed base for added stability. As is the case with most of their home gym gear, Bowflex provides you with an instruction placard so that you can ensure that you are getting the exercises right. This is a nice addition that you don’t get with other pull up towers. The maximum user weight on the Bowflex Power Tower is an impressive 300 pounds, meaning that users of up to 250 pounds will be good to go on this one (always keep a 50 pound buffer between your weight and the max user weight). The main problem with the Bowflex Power Tower is the price. It is the most expensive tower in our review, and though it offers some great features, lesser priced models will get the same job done. The Gold’s Gym XR 10.9 is a solid, middle-of-the-road pull up tower that is both affordable and reliable. Here’s what we especially liked about this one. All of the movements on the XR 10.9 are able to be performed with proper form and great functionality. You get some generous padding on the arm rests and back pads. The pull up bar on the XR 10.9 has angled ends to provide you with more positioning options. You also get padded grips on the pull up bar. The XR 10.9 is made from solid steel tubing and provides you with rigidity stabilizers. The result is a solid unit that will not wobble when you’re powering through your workout. The max user weight on this unit is 250 pounds. This will be fine for most users, but if you are in excess of 200 pounds, you might want to step it up to the Fitness Reality X-Class. The dip bars on this unit are a little too wide for shorter people. As mentioned already, the weight capacity may not be sufficient for people over 200 pounds. 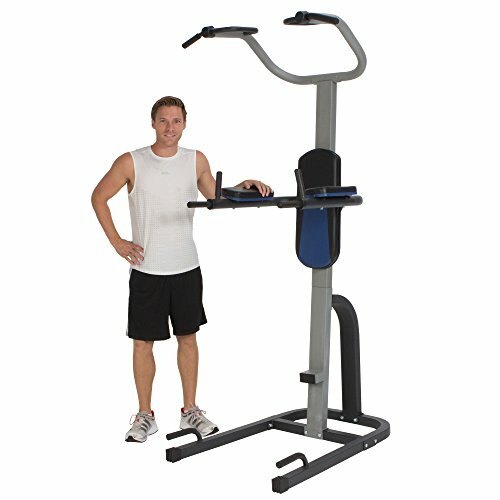 The ProGear 275 Power Tower is a uniquely designed unit that looks cool and delivers with the following features. 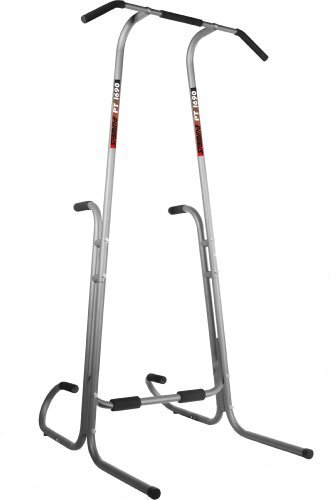 This unit features angular, reinforced tubular steel framing with extended leg stabilizers to ensure that you will not wobble when you’re grinding through a set of pull ups. The 275 in the name of this product refers to the fact that it provides you with 275 pounds of maximum user weight capacity. This is 25 pounds more than the standard for a unit in this price bracket. 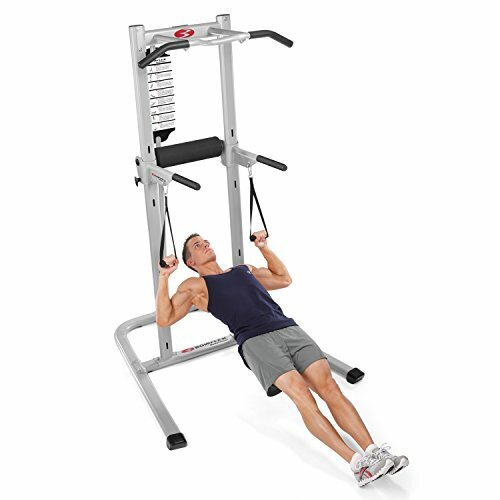 Keeping in mind that you should have a 50 pound gap between your actual weight and the capacity of the unit, this will accommodate people up to 225 pounds in weight. You get a good amount of back and armrest padding on this unit, which makes for a pretty comfortable workout. The ProGear 275 Power Tower base needs to be more solid. Various reviewers have mentioned having to put extra weights on it while they are doing their pull ups. Some people also mentioned missing parts upon delivery. 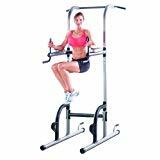 The Stamina 1690 Pull Up Baris the most cost effective quality pull up bar that we have come across. Consider its strong points. The Stamina 1690 is a pretty basic unit that delivers what you need in a slimline compact design, making it ideal for people with limited workout space. It is lightweight so you can move it around quickly. While it’s obvious that you cannot compare the 1690 with the likes of the Fitness Reality X-class in terms of rigidity, this unit does provide you with a surprisingly solid support as you are hanging from it. The max user weight is 250 pounds, which is the same as the Gold’s Gym XR 10.9. Still, it is not quite as rigid as that model and you should only buy this if you are 200 pounds or under. The big downfall with the Body Solid 1690 is that there is no vertical knee raise, or VKR, section on it. You can compensate for this by doing your hanging knee or leg raises directly from the pull up bar. However, this may lead to a slight wobble from the unit. The Body Champ Fitness Power Toweris a solid, medium priced unit that gives you the following features. The arm and back rests on the Body Champ Power Tower provide you with a good level of cushioning that adds comfort to your workout. There is nothing worse than having to put up with forearms digging into the frame while doing vertical knee raises. You will not have that problem on this unit. The Body Champ provides you with an angled pull up bar so that you can work your back from different angles. The bar also has two sets of hand grips to allow for even more variety of positioning. The adjustable foot grips on the Body Champ are slip resistant and fully adjustable. They also double as push up bars. 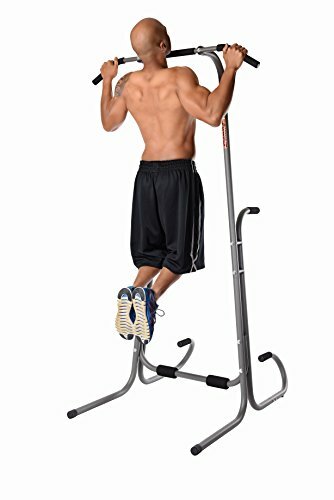 The Body Champ pull up tower is a decent, budget-level unit. 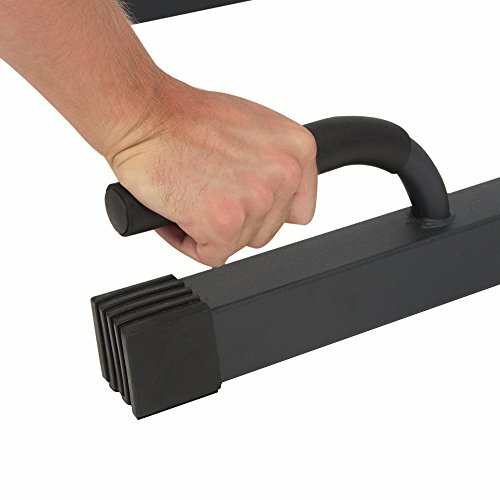 However, several customer reviewers have mentioned that the holes for the pull up bar either do not line up or were missing completely, requiring them to drill the holes themselves. You will most likely get a unit where it all lines up perfectly, but it is something to keep in mind. Not all pull up towers are equal. Yet, the one you select is going to be supporting your entire bodyweight in some pretty precarious positions. The following key buying considerations will ensure that you select the one that will provide you with the rigidity, performance, and comfort that you need. The maximum weight capacity of the pull up tower should be at least 250 pounds, but 300 pounds is preferable. This will provide plenty of scope for larger users as well as covering the potential to perform pull ups with added weight strapped to your body. Pull up towers that have a max weight of less than 250 pounds are likely to wobble when being used by people who are more than 225 pounds. As a general rule, you should always buy a product that has a max weight that is at least 50 pounds heavier than your own bodyweight. Check your available space before starting to shop for your pull up tower. Be sure to add enough space around and above the pull up tower to move comfortably when doing exercises like dips, push ups, and pull ups. You should allow a minimum of 25 inches between the top of the pull up tower and the ceiling. Although it won’t give you as many exercises, you can opt for a pull up bar if you don’t have enough space. I feel that some type of pull up bar or tower is essential home gym equipment, but the choice is up to you. On a standard 7′ tower, people who are under 6′ 3″ in height will be able to perform pull ups without having to unnaturally bend their knees. However, if you are taller than that, you may have problems in this area. People who are taller than 6’3″ should look for a tower that is 7′ 6″ in height – just be sure that your ceiling height will still allow a 25 inch clearance for proper range of motion while doing moves. The dip bars on some pull up towers are not rigid enough to consistently support a person’s body weight, so check reviews on this point. Shorter people may also find that the dip bars are a little too wide for comfortable performance. If you are shorter than 5′ 6″, you should look for a pull up tower that is 3 feet in width. The last thing you want is a pull up tower that wobbles and shakes when you are in the middle of an intense workout. You need to look for a heavy duty frame that is supported by extended stabilizers. You should also check customer reviews for any mention of wobbling in use. Sometimes, the wobbly nature of a tower results from improper assembly.Be sure to follow the assembly instructions and fully tighten every bolt. Make sure that the dip and pull up bars on the pull up tower come fitted with hand grips. They should be non-slip and sweat resistant. Check customer reviews to make sure that the grips are adequate. You will have to assemble your pull up tower. This should be a relatively easy task but you should check customer reviews to make sure that the holes line up and that no parts are missing. As with anything, the more you pay, the better the quality of product. However. you should expect to be able to pick up a quality, rigid and high performing pull up tower for less than a hundred and fifty dollars. What exercises can you do on a pull up tower? 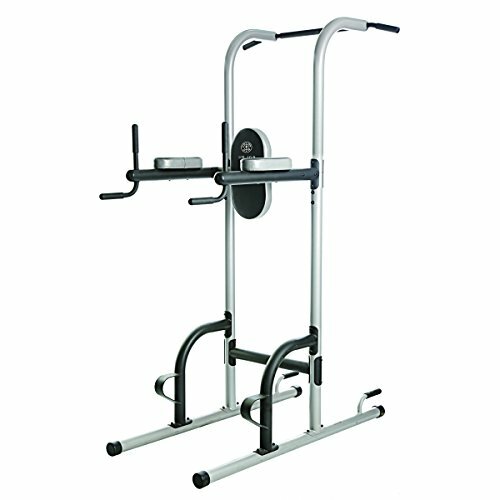 A pull up tower is a free standing unit that features a pull up stand, along with dip bars and pads for leg raises. It will usually also have a push up stand at the base, which allows you to perform push ups. This allows you to get greater range of motion than if you were doing push ups on the floor. What is the difference between pull ups and chin ups? Pull ups and chin ups are similar exercises that both focus the effort on your back and bicep muscles. Pull ups involve pulling yourself up to the bar with your palms facing forward. This exercise places primary stress upon the latissimus dorsi muscles of your upper back. Chin ups involve having the palms facing toward you. This exercise switches the emphasis from the upper back to the bicep muscles. Chin ups are generally easier to perform than pull ups. Beginners may wish to start by doing chin ups and then advancing to the harder movement when they have built up a base of strength. What do hanging leg raises do? Hanging leg raises are an excellent exercise to work the lower abdominals. To perform them, position yourself on your pull up tower with your elbows resting on the arm pads and gripping the handles. Hang with extended legs. Now pivot from the hips to bring your legs up as high as you can. Do not bend at the knees but, rather, contract your abs to bring about the movement. Now slowly lower and repeat without benefitting from momentum. An easier version of this exercise is the hanging knee raise. To perform this exercise, begin in the same position but, this time, bend your knes to draw them up as high as possible. Now slowly lower and repeat, again without the aid of momentum.